This class represents ECGDSA public keys. Definition at line 18 of file ecgdsa.h. Construct a public key from a given public point. Definition at line 27 of file ecgdsa.h. Definition at line 36 of file ecgdsa.h. Definition at line 44 of file ecgdsa.h. Referenced by Botan::ECGDSA_PrivateKey::create_signature_op(), and create_verification_op(). 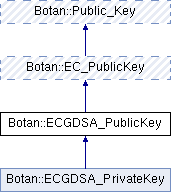 Reimplemented in Botan::ECDSA_PrivateKey, Botan::SM2_PrivateKey, Botan::ECGDSA_PrivateKey, and Botan::ECKCDSA_PrivateKey. Definition at line 56 of file ecc_key.cpp. References Botan::EC_PublicKey::m_domain_params, Botan::EC_PublicKey::public_point(), Botan::EC_Group::verify_group(), and Botan::EC_Group::verify_public_element(). Definition at line 137 of file ecgdsa.cpp. Definition at line 48 of file ecgdsa.h. Definition at line 46 of file ecgdsa.h. Referenced by botan_pubkey_sm2_compute_za(), Botan::EC_PublicKey::check_key(), Botan::ECGDSA_PrivateKey::check_key(), Botan::ECKCDSA_PrivateKey::check_key(), Botan::SM2_PrivateKey::check_key(), Botan::ECDSA_PrivateKey::check_key(), Botan::EC_PublicKey::EC_PublicKey(), Botan::GOST_3410_PublicKey::public_key_bits(), Botan::EC_PublicKey::public_key_bits(), and Botan::ECDSA_PublicKey::recovery_param().